Founded by Robert Slater, the group now known as the Green Valley Community Chorus began in 1974 as separate men’s and women’s choruses. The first concert was given in October of 1975 with the two choruses singing several songs separately and together. Today, the chorus has evolved into a full mixed concert ensemble performing an array of concert works of the most treasured choral-orchestral masterworks of western music history. As of May 2014, the Chorus has entered into partnership with the University of Arizona to allow highly talented doctoral candidates in Choral Conducting refine their skills and broaden their experience by serving as Music Director of the Chorus during their doctoral studies. We are pleased with the growth and expansion of our collective talents which this partnership has brought both to us as singers and to our audiences. With each ticket purchased by the members of our community, $1.50 is donated to the Community Performing Arts Foundation, in addition to half of the proceeds from the Summer Concert ticket sales. The Helen Nelson-Carroll Scholarship Committee has awarded scholarships to music students at the University of Arizona, and donated money to local school systems to purchase music books for the lower grades and to support the choral music programs of these schools. Since the Chorus was formed we have awarded over $55,000 to Continental School, both Sahuarita and Walden Grove High Schools, and to the University of Arizona Choral Conducting program. Friday, April 5, 2019–GVCC presented a check from our Chorus to Walden Grove High School for $1,000 to further our mission of promoting choral music in our Community. Pictured L to R: Benjamin Lebovitz, Director of Choral Music and Theatre, Walden Grove High School, Bobbie Richards, GVCC Scholarship Chair, and Chris Laughland, Assistant to the Principal, Walden Grove High School. Not pictured: Betty Atwater, GVCC President. Wednesday, March 6, 2019–GVCC presented a check from our Chorus to the Sahuarita High School Choir in the amount of $1000. Pictured from left to right are GVCC President Betty Atwater, GVCC Scholarship Chair Bobbie Richards, Sahuarita High School Choir Club President Katie Zinn, Vice President Sabrina Molina, Treasurer Thomas Trejo, and Sahuarita High School Choir, Band, and Orchestra Director Christine Garcia. 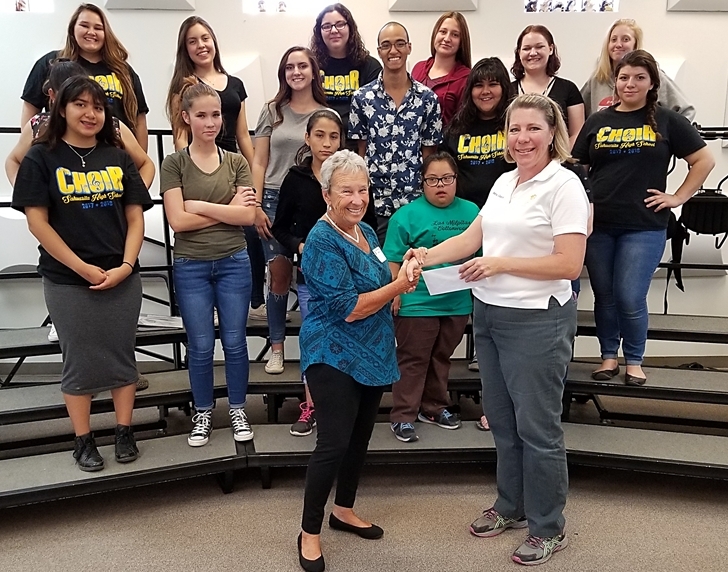 Thursday, December 13, 2018–GVCC Scholarship Chair Bobbie Richards presented a $1,000 grant to Continental School, Green Valley, for use in their choral music programs. Pictured L to R–Joe Ferguson–Band and Choir, Continental School, Bobbie Richards–GVCC Scholarship Chair, Seth Murzyn–Orchestra, Band, and Elementary Music, Continental School, and Continental School Principal Mary McNichols. Thursday, November 1, 2018 — GVCC Scholarship Chair Bobbie Richards presented a $4,000 scholarship to Thomas Wininger. Thomas is a second year DMA candidate in Choral Conducting at the University of Arizona. A Nebraska native, Thomas received a Bachelor’s degree in Piano Performance from Wartburg College in Waverly, IA and a Master’s Degree in Choral Conducting from the University of Nevada in Reno. October 27, 2018 — 25+ members of our 80+ member GV Community Chorus participated in the 2018 White Elephant Parade. The theme of the parade was “Making Music Together”. Chorus members had fun singing songs along the parade route to support this theme and the White Elephant. We are grateful that the White Elephant has supported GVCC with a grant for the last three years! Thank you White Elephant! On April 23, GV Community Chorus Scholarship Chair, Bobbie Richards presented Ben Lebovitz, Walden Grove High School Choir Director, with a check in the amount of $1,000.00 in support of GVCC’s mission to promote Music Education in our community. 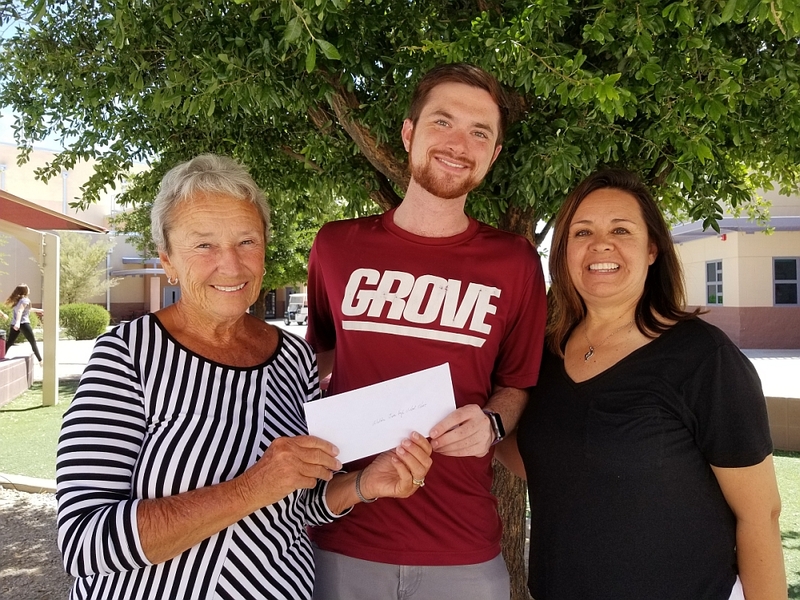 In support of the Arts in Green Valley, the Green Valley Community Chorus Scholarship Chair, Bobbie Richards, presented music teacher Seth Murzyn a $1,000 check for the Continental School choir program. The Green Valley Community Chorus participated in the White Elephant Parade on October 28, 2017. The White Elephant Charity has been very generous in awarding GVCC grants for the past 2 years. Thank you, White Elephant! We “pay it forward” by awarding grants and scholarships to local schools and the University of Arizona. Friday, September 29, (2017) — Bobbie Richards, GVCC Scholarship Chair, presented John McMeen with a check in the amount of $4,000. John has an undergraduate degree in Music Education from Lipscomb University in Nashville, and a Masters of Music degree in Choral Conducting from the University of Mississippi. He is in his second year in the DMA program at the University of Arizona and will also be assistant to Dr. Bruce Chamberlain with the Tucson Symphony Chorus. Pictured (L to R): Betty Atwater, Dr. Bruce Chamberlain, John McMeen, and Bobbie Richards. Thursday, May 18 (2017) — Ben Lebovitz, Choir Instructor at Walden Grove High School accepted a $1,000 check from the Green Valley Community Chorus. L to R: Dr. Manuel Valenzuela, Superintendent SUSD #30; Betty Atwater, GVCC Board President; Ben Lebovitz, WGHS Choir Director; Bobbie Richards, GVCC Scholarship Chairperson; and Hector Estrada, WGHS Assistant Principal. Wed., May 11, 2017 — The Green Valley Community Chorus Scholarship Chairperson, Bobbie Richards, presented a Certificate of Scholarship in the amount of $1,000 to Autumn Watson, a senior at Sahuarita High School. Pictured L to R, back row: Meegan Burr (SHS Counselor), Karla Nistler (SHS Counselor), Thomas Herrera (SHS Choir Director) and Scott Downs (SUSD Assistant Superintendent). Front Row: Bobbie Richards and Autumn Watson. Ms. Watson will be attending Brigham Young University in the fall in pursuit of a degree in music.